To make the Tea Ice Ball Cubes, boil water in the boiler till it reaches 95-100 degrees Celsius. 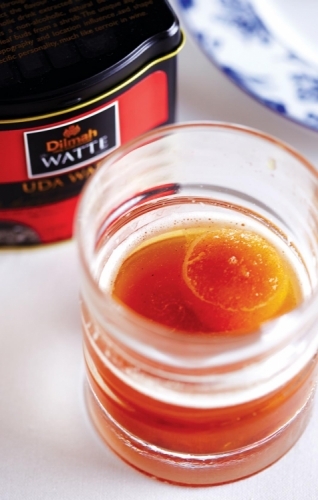 Take 1.5 grams of Dilmah Uda Watte tea in a teapot; add boiling water to the tea, stirring while water is being poured in. Allow tea to brew for at least 5 minutes, strain the tea to another teapot and allow to cool. Now pour tea into a silicon round ice mould and freeze. Assemble the mocktail by boiling water in the boiler till it reaches 95-100°C. Then, take 1.5 grams of Dilmah Uda Watte Tea in a teapot; add boiling water to the tea, stirring while water is being poured in. Allow tea to brew for at least 5 minutes, strain the tea to another teapot and allow to cool. Take a Boston shaker and add raspberry, kiwi and vanilla sugar syrup. Muddle. Add Dilmah Uda Watte tea (cooled) to muddled mixture. Shake the drink well and pour through a double strainer into the glass over the Tea Ice Ball Cubes and serve with more Tea Ice Ball Cubes.